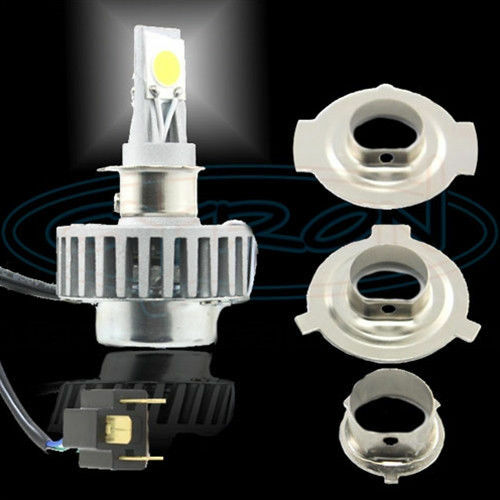 Get the advantages of LED light for your motorcycle headlight at a fraction of the cost. Why replace the entire housing when you can just replace the lamp and save hundreds of dollars. Retrofit, Do Not Replace! Fits mostly H4 style bulbs. Drop in replacement for most Harley Davidson model years 1992 and newer. Lists of models that will not fit or may need modification. Basically the headlight bucket must have a min 3.5" of depth clearance. Consult your motorcycle manual for type of bulb and the fittings. 1 year limited manufacturer warranty. Not DOT tested. Designed according to DOT specifications. Due to higher brightness of the LED bulb the headlight trim angle may need to be adjusted to avoid disturbing other drivers.